The RCD holds trainings and workshops on farm water, soil and vegetation management for both English- and Spanish-speaking farmers. 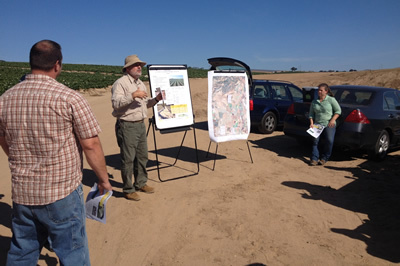 Private landowners, government agencies, and non-profit organizations can contract with the RCD to provide training and workshops services related to nutrient management, irrigation efficiency and erosion control. This winter, RCDMC will provide irrigator training to irrigators across Monterey County with grant funding support*. *Grant funding has been provided by California Dept. of Food and Agriculture (FREP-SCBG and FarmLink) and Department of Water Resources (DWR-WUE).